Nautiraid’s folding canoes have aluminium longitudinal frames with reinforced plastic cross members, covered over by a tough PVC skin. They are beautifully designed, and much more hydrodynamic than inflatable types. Stabilair low-pressure inflatable tubes down the sides give heeled stability and buoyancy (all models). 110x35x15cm – so you can carry it in the back of almost any car, or even as baggage on a plane! There is also a smaller one-person version (max load 80kg) of this folding canoe, the Beach 325. 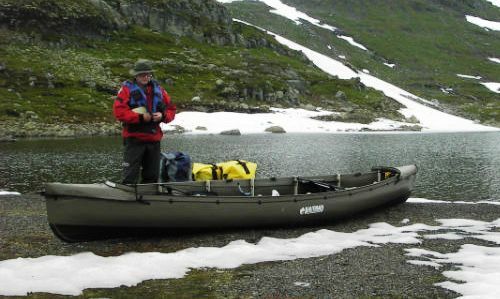 For touring expeditions – packing serious loads – there is the Rando 450 at £1850, and the Rando 520 (pictured here, in Norway) at £2050, with an enormous carrying capacity of up to 350kg. The 450 is perhaps best-suited to the more accomplished paddler; the 520 is more forgiving and will take greater loads – the whole family even, with additional seats (option) – but not quite as responsive. People often ask “how long does a folding canoe take to assemble?” and the answer depends on how many times you’ve done it before. For the largest fold-up canoe model, the Rando 520, it’s possible to get from folded up in the car boot to assembled in the water, in 20 minutes – or possibly even a bit less (it might take you double that the first time though). The 450 is similar; the 390 and 325 have fewer frames so 15 minutes is realistic. 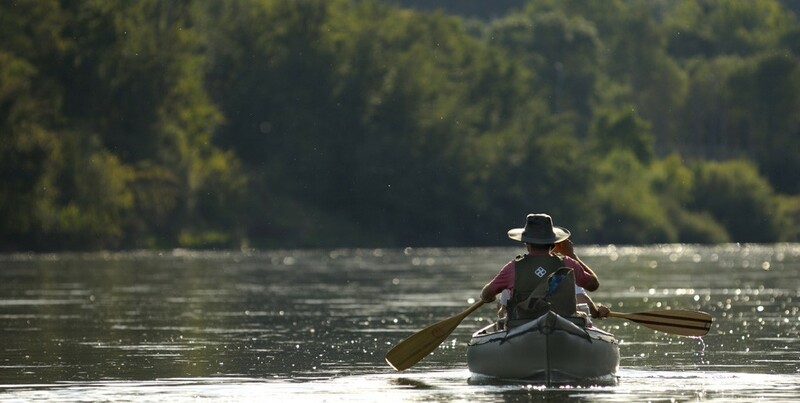 There is nothing particularly difficult in the canoe folding process and much of it is akin to assembling a tent, only with much heavier duty poles and skin. etc. Also we don’t think many airlines would accept an object 5.2m (over 17ft) long as baggage either… even the (largest in range) Nautiraid Rando 520 can fit in a bag measuring just 110x60x25cm, and weighs less than 25kg. For efficiency in storage and portability these folding canoes are an excellent solution. 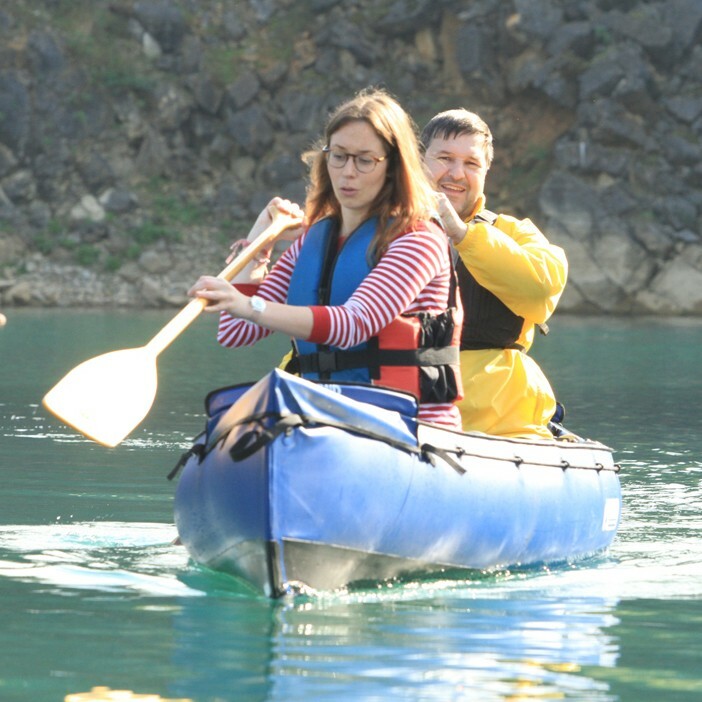 Nautiraid Canoes and Kayaks are available in four colours; green, white, blue and red. canoe into a decked canoe, massively reducing chance of taking on water, with the option of adding a spray skirt for further enclosure. The Rando 520 ‘Storage spray deck’ is like a spray deck except it has no holes for people. This cover is used on the assembled 520, when not in use by a paddler, protecting stored equipment, luggage and sandwiches from rain and bears. Further accessories include paddles, spray skirts and decks, and an extra middle seat for the Rando range. Find out more about the Nautiraid range.